Two birds of prey have died after fire broke out in an aviary at a safari park near Stirling. Staff at Blair Drummond Safari Park called the emergency services just before 21:00 on Wednesday. Managers believe the blaze was caused by a fault in a heating system in the bird of prey centre at the park. The birds, a Ruppell griffon vulture and a white-tailed sea eagle, both died in the fire which was quickly brought under control. Park manager Gary Gilmour said: "We are sad to announce that two birds of prey have died in a fire at Blair Drummond Safari Park. "On-site safari park staff reacted immediately. The rapid response from Scottish Fire and Rescue ensured that the fire was quickly contained and extinguished. "The fire has destroyed two aviaries and a store room in our bird of prey centre. "Unfortunately, there was nothing that could be done to save the birds in these aviaries and a Ruppell griffon vulture and a white-ailed sea eagle both died." A vet has checked other animals in the section and they are not thought to have been affected by the fire. Mr Gilmour added: "Our bird of prey keepers Callan, Dom and Mark have a very close bond with the animals they look after and are understandably very upset at this event, as we all are." Incident commander Alex McCutcheon from Strathclyde Fire and Rescue Service said: "On arrival the fire had already taken hold of two aviaries - but quick and decisive action ensured that the fire was contained to stop further fire spread and extinguished. 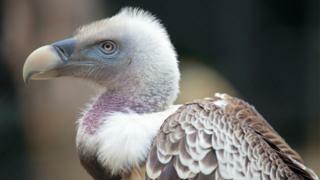 "Safari park staff and crews managed to save the majority of the birds and relocate them, but sadly two did not survive. "I would like to thank the firefighters involved for bringing this incident to a swift conclusion, and also the staff at the park for their assistance." Staff at the park recently held an emergency training exercise with the Scottish Fire and Rescue Service involving a pride of lions. The bird of prey centre was closed to visitors on Thursday but is expected to reopen on Friday.